Medecins Sans Frontieres (MSF) Chaman Balochistan. Medecins Sans Frontieres/Doctors without Borders (MSF) is an international, independent, medical humanitarian organization providing medical assistance to people in need, irrespective of race, religion, gender or political affiliation. We are seeking qualified and highly motivated applicants for our project in CHAMAN, Baluchistan. • Valid PNC registration card. • Desirable 1-year experience in a hospital setting. • The satisfactory level of English, proficient in Urdu and relevant local language. • Capacity to work in a multidisciplinary and international team. 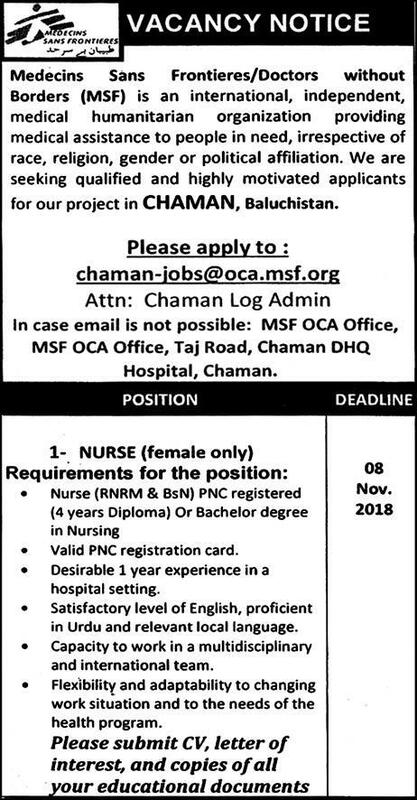 Please apply to chaman-jobs@oca.msf.org, Attn: Chaman Log Admin In case email is not possible: MSF OCA Office, MSF OCA Office, Taj Road, Chaman DHQ Hospital, Chaman. latest by 08 November 2018.